Banks have been responding in interesting ways to their unpopularity. This of course was brought about by a series of largely self-inflicted wounds: the credit crunch, computer lapses, PPI and investments mis-selling, indefensible banker bonuses and so on. And the last couple of weeks we have the spectacle of HSBC money laundering in Switzerland. HSBC certainly has an open mind to money laundering. Banks have tried lots of ways to deflect attention from all this. The main broad tactic is to position themselves not being vast corporate pirates, but as on our side. Barclays, typically tied themselves in knots to do this, adopted at one point a postmodern approach with their Barclays Squirrel of Postmodern Irony. NatWest, meanwhile, began to provide ‘helpful banking’, and much of their marketing focused on how their helpful staff were ordinary people just like us, who nurtured the modest ambition to be helpful. Of marketing in the UK NatWest’s approach seemed to me to be the best way to sidestep unpopularity. They did so by re-positioning their offering in in what I call ‘real life’ territory. Their ambitions appear modest, but plays to an awareness of how difficult ordinary life is for us ordinary folks. And of course by saying they are ordinary just like us, we can almost have sympathy for them too. Very clever. But the hair shirt is still there. 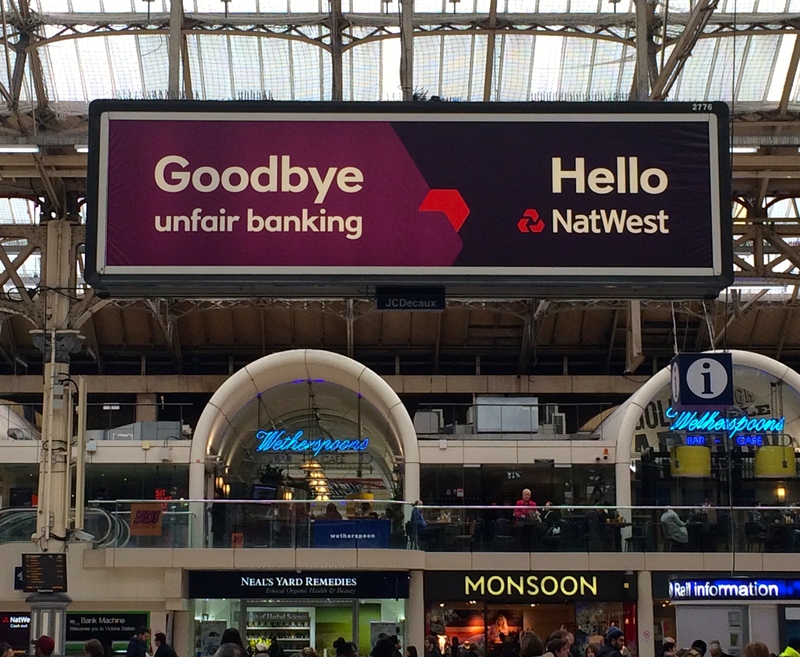 Passing through Victoria Station yesterday I noticed a huge banner with its stale old hello/goodbye riff. But its implicit acknowledgement of the sector’s guilt made me grin. How did it all end up in such a marketing mess for the Banks? This entry was posted in Marketing, Postmodern Irony, Real life and tagged Banks, HSBC, Natwest. Bookmark the permalink.